Asian banks could enjoy a 35-45 per cent boost in net profit over the next three years if they embrace digital channels to reach their customers. In a report on digital banking in Asia, McKinsey & Company notes that the value creation potential is very high, especially in emerging Asia, where banks lag well behind their leading Western counterparts in automating banking processes. The analysis also shows that up to 20-30 per cent of net profits are at risk for Asian banks that are unable to leverage on digital technologies. For example, banks in mature Asian markets have invested in refining their operating models over the past few years, yet much remains to be done to follow through on the promise of a fully digitised customer experience. Only 5 per cent of processes are fully automated and only 25 per cent of processes are technology enabled at the banks examined. Speaking to BT, McKinsey's Joydeep Sengupta said that banks in Singapore are very well positioned to take advantage of digital banking trends: "The digital infrastructure is among the best in Asia, the regulatory environment is conducive to innovation and adoption rates among consumers is high." Mr Sengupta, who is senior partner at McKinsey & Company and head of McKinsey financial institutions practice in Asia, however, added that most banks in Singapore have barely scratched the surface in terms of realising the potential. Most of the existing investments have been around creating digital propositions, largely with a branding benefit. "In the core areas of fundamentally transforming the business model, either through digitally enabling the bank to improve productivity or digitising the processes to enable significant efficiency and superior customer experience, or offering a customer oriented digital proposition, Singapore banks have much distance to travel." The report shows that the number of digital banking consumers in Asia could reach 1.7 billion by 2020, with China, India, and the Asean region showing the biggest gains. The Asean region and Australia are expected to have 150 million customers by 2020. Mr Sengupta said that the use of digital banking services has been increasing on average by more than 35 per cent over the past three years. Interestingly, this increase coincides with a drop in (physical) bank branch usage of 27 per cent across Asia. With over 20 per cent of online sales in some products, banking in Asia is already ahead of online sale of groceries (10 per cent) but way behind music which has more than 50 per cent of online sales in the region. At a few leading banks, nearly 20 per cent of key product purchases are now completed online. Across Asia, about 25 per cent of pre-purchase decision-making and 40 per cent of post-purchase servicing is conducted through mobile or Internet devices, the report added. Mr Sengupta noted that cybersecurity is one of the biggest challenges that banks face. "Asian banks are realising that cybersecurity must be treated as a core business function. Many of the current approaches and responses are passive - looking out for known threats, waiting for sensors to trigger alarms and in general often backward looking." 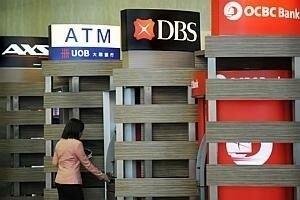 Asian banks need a new approach, one that avoids large staff increases and is better able to use existing security assets, such as fraud detection units, compliance and risk resources in a cross functional manner, moving from the alert and reaction approach to one where they can anticipate and hunt for malicious activity affecting their most critical assets, the McKinsey official added.